The Bluffs on the Waterway is a very exclusive, gated community of custom homes in Carolina Forest. The neighborhood is small, with only about 100 homes, and sits overlooking the breathtaking Intracoastal Waterway. Just minutes away from Highway 31 off River Oaks Drive, residents of The Bluffs have convenient and easy access to every area on the Grand Strand. 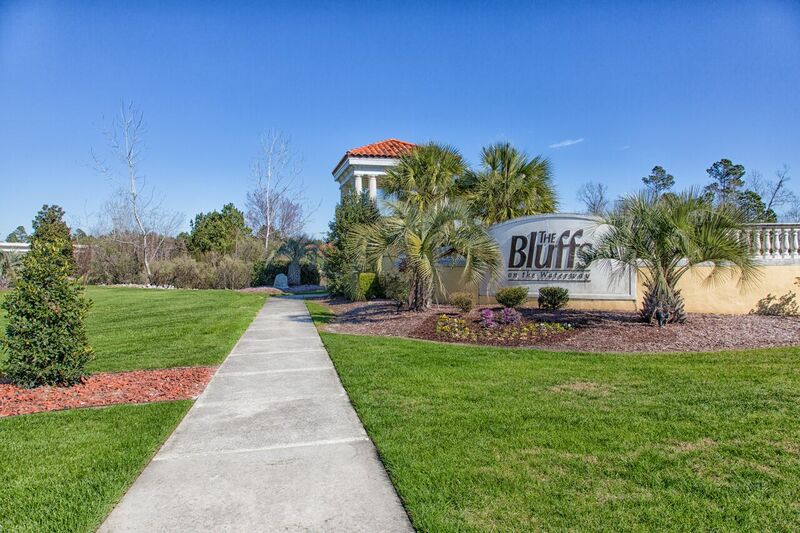 Residents of the Bluffs on the Waterway are 10 minutes or less from almost every one of the Grand Strand’s shopping centers, restaurants, golf courses, parks, and the Grand Strand’s number one attraction, the beach! It’s also an easy drive to the Myrtle Beach International Airport and Coastal Grand Mall. Homeowners in The Bluffs on the Waterway enjoy a large pool, 2 clubhouses, a floating community dock on the waterway, a private boat launch, boat storage, tennis courts, a children’s play area, and public waterway access. Just a short drive from some of the Grand Strand’s best golf courses, the neighborhood has numerous beautiful large lakes with fountains and sidewalks for walking. The Bluffs on the Waterway also has some of South Carolina’s best schools. While the landscaping and amenities at the Bluffs are some of the community’s great attractions, the magnificent homes are the main attraction. Most of the homes in The Bluffs are Mediterranean style of stucco and brick construction with tile roofs. Many of the homes overlook the waterway and have private docks. Others offer a beautiful view of the lakes. The homes are 3, 4, or 5 bedrooms. They sit on 3,000 to 5,000 square feet of manicured land and range from the low $400s to over $1 million. There are still a good selection vacant lots available, some on the waterway and some lake-front. Waterfront lots range from $60k to $300k and lot owners are welcome to use the builder of their choice. Home seekers looking to buy or to design and build their perfect dream home, need to look no further than the Bluffs on the Waterway. It is one of the finest and most exclusive communities on the Grand Strand. It simply doesn’t get any better than this. Contact Jeremy Jenks, Vice-President of Sales at The Trembley Group Real Estate for more information about the most beautiful Waterway lots and homes in Myrtle Beach and Carolina Forest.